Who's in charge? 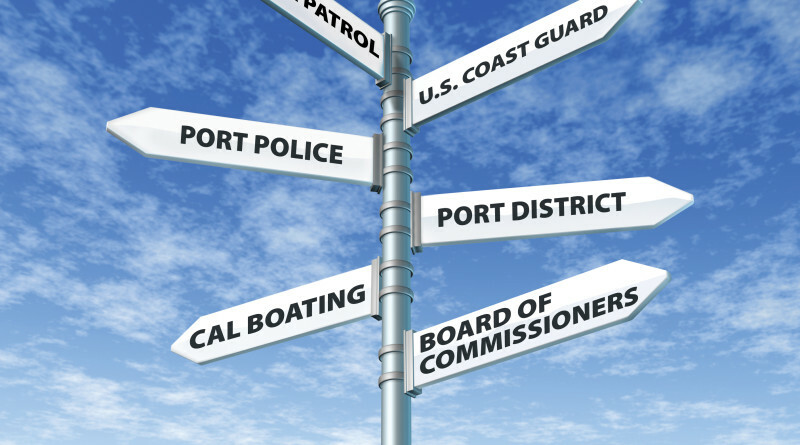 Harbors, marinas and ports are always subject to overlapping jurisdictions of local, state and federal agencies. SOUTHERN CALIFORNIA — Southern California is home to more than one harbor district or department governing tens of thousands of boats and hundreds of miles of coast. Each district or department has its unique way of operating. Private management companies overseeing specific marinas also factor into jurisdictional questions. The Port of San Diego, for example, is a unified district where five cities collectively govern and manage the harbor’s tidelands and waterfront. A port district entity was also established to manage the waters of Ventura Harbor, while city departments manage harbors in Santa Barbara, Redondo Beach, Long Beach, Newport Beach and Oceanside. County officials manage harbors in Dana Point, Huntington Beach, Marina del Rey and Oxnard. State and federal level agencies also play a role in harbor governance. In some places the overlap of local, state and federal agencies functions like a bowl of alphabet soup. Through it all a boater might find it confusing to know who is in charge, especially whenever a problem arises. The Log broadly looked at harbor operations at the ports of Los Angeles and San Diego to provide a snapshot of who is in charge and how multiple agencies work together to manage Southern California’s recreational and commercial boating venues. Michael Graychik, a captain with the Los Angeles Port Police, said general state laws take precedent in all harbor districts. The state of California claims waters from 3 miles out and inward, as far as jurisdiction goes, Graychik explained. Accordingly every port operates within state law. Local waterways are also a part of state tidelands trust. Accordingly port districts and harbor commissions can manage local waterways with grants given to cities by the state. The Port of Los Angeles, for example, is allowed to manage and oversee marina operations, navigational channels and the flow of cargo in and out of terminals thanks to powers granted to the Board of Commissioners and City Hall by the state’s tidelands trust. In San Pedro and Wilmington a port authority was established in 1907 to manage the harbor area’s commercial and recreational traffic. As part of the relationship between port, city and state there are rules in place to ensure money made on tidelands property and harbor waterways must be put back into the port. Graychik said all aspects of the Port of Los Angeles function as a leasehold, meaning marinas and terminals are governed by landlord-tenant relationships. There are 16 marinas in San Pedro and Wilmington, for example, all of which are managed by a company hired by the city of Los Angeles and the port’s Board of Commissioners. Harbor operations at the Port of San Diego are similar to its cousin a few hours north. San Diego Harbor Patrol monitors and patrols the entire bay, which is managed and overseen by a five-city port district. The Harbor Patrol has jurisdiction over launch ramps, marinas, docks and piers. A port or harbor is often governed by a local agency or some combination of city, county, state and federal entities. San Diego Bay, for example, has several overlapping agencies monitoring or operating within the bay, including the port district, Harbor Police, Drug Enforcement Agency, U.S. Coast Guard, U.S. Navy, and U.S Customs and Border Patrol. Despite the strong presence of federal authorities the San Diego Unified Port District, an independent public agency created by the California legislature in 1962, governs much of the harbor’s operations. The port district is an amalgamation of five member cities – Chula Vista, Coronado, Imperial Beach, National City and San Diego – and specifically manages 34 miles of public trust tidelands and 3,500 acres of tidal waters. San Diego’s Board of Port Commissioners makes land use decisions along the district’s waterfront, though the State Lands Commission and California Coastal Commission have oversight responsibilities. Individual marinas have jurisdiction over slips and liveaboards. The lease between boat owners and marina govern the rights and responsibilities of both parties. The port district, according to Tanya Castaneda, the port’s public information officer, governs the rights of anchorage users. “As for boaters who get permits from the Port of San Diego to anchor, the permits are generally only 72 hours for La Playa Cove and Glorietta Bay and 30 days with two renewals for a maximum of 90 days in the A-9 Cruiser’s Anchorage so technically no one can ‘live aboard’ for longer than their permit allows,” Castaneda said. Dreher explained the ebbs and flows of San Diego Harbor Police’s direct responsibilities and association with other agencies. Harbor Police also works with the port district and state’s Department of Boating and Waterways to keep regulations up to date, revise laws and maintain infrastructure. “The Harbor Police basically oversees all the above water related issues/events and does what it can to keep this area safe,” Dreher said. An interesting spin on the landlord-tenant relationship between city, state and boaters recently played out with the handful of remaining tenants at Ports O’Call Marina. The Port of Los Angeles’s Board of Commissioners recently voted to replace Ports O’Call Marina with a new waterfront village with new restaurants and shops in an effort to draw more visitors and tourists to the area. Most boaters there already vacated their slips and the marina as a whole has become dilapidated. The remaining boating tenants at Ports O’Call Marina alleged they were being wrongfully evicted from the place they called home for decades. Some said they were either priced out of nearby marinas or not welcome at others. The Port of Los Angeles told The Log Ports O’ Call Marina has been under control of the city’s Harbor Department since March 1 and boaters still in slips are subject to an unlawful detainer proceeding. Sanfield added boaters were notified their respective slip rental interests were being terminated on Feb. 12. There were about 10 boaters still at Ports O’Call Marina on May 25, one boater told The Log in a phone conversation. Another boater said he was aware unlawful detainer actions were in the works but everyone was awaiting legal notice. Sanfield said the Los Angeles Harbor Department is in the process of shutting down Ports O’ Call Marina to make way for the new San Pedro Public Market. Any boaters still parked in a slip are doing so illegally. Maritime attorney David Weil penned several columns in The Log addressing the legality of liveaboards and boaters being evicted from a slip or marina. He explained while liveaboards might consider their vessel a home, the space they are renting from a marina is nothing more than a parking space. Accordingly the boater is not being evicted from a residence. Weil again addressed marina tenancies and evictions in a November 2015 column. “Liveaboard marina tenants usually own their boat and as such they own the ‘structure’ in which they are living. Since a marina tenancy concerns a parking space rather than a dwelling boat owners are not protected by federal or state fair housing laws, regardless of whether federal maritime law applies to the tenancy,” Weil explained. He added boaters do have two narrow protections when it comes to landlord-tenant laws. One legal protection prevents boaters from facing a “retaliatory eviction,” where a marina moved forward with an unlawful detainer proceeding against a slip renter solely because the boater exercised his or her legal rights. Another legal protection is California’s Floating Home Residency Law. However this law only protects boaters who live aboard vessels with attached sewer pipes and permanent electrical power (complete with a physical meter). The law does not apply to boats berthed in a slip and using a plug-in shore cord. Every port and harbor is managed by a different agency at the local level. Below is a list of the lead agency at every port or harbor between Santa Barbara and Chula Vista. ← Dana Point Harbor: What’s next?